A complicated double jaw fracture, an operation, three days at the horse hospital and a full month of intensive care – those were the consequences of Gazpacho’s loyalty to the two horses in whose footsteps he faithfully follows day by day. How come his fidelity made the old mule suffer so badly? Well, the young stallion living in the adjacent field jumped the fence to mount one of our mares. Brave Gazpacho came to her rescue and was kicked in the face. So he paid for of his lady’s short sexual adventure. Hopefully now the neighbour’s insurance will pay up for him! 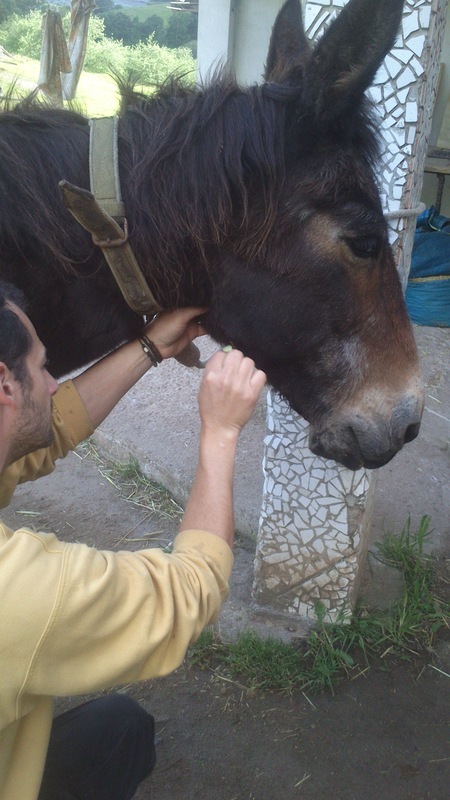 Gazpacho was rescued some years ago in the mountains around Oviedo where he roamed the commons in a group of horses. He thinks he is a horse and he looks like a horse. But his call gives him away; he produces a unique mixture of a whinny and a bray: a brinney. Here, in the Donkey Paradise, he always follows the horses and doesn’t ever lower himself to the donkey level. Also he would keep a sound distance from us, human animals.